January 31, 2019 9:46 am. It was after 11pm when Douglas Whyte walked quietly away from his final night as a jockey at Happy Valley on Wednesday (30 January). The brilliant lights which illuminated so many of his 572 successes at the world’s most famous city track had dimmed but nothing could extinguish the vivid memories of an evening in which racing fans, young and old, saluted the most dominant rider in Hong Kong racing history. Whyte came into his Valley swansong unsure about how he would feel on his final night but one thing that was never in doubt was the warmth of the welcome awaiting him. Veteran Hong Kong punters jostled for room at the far end of the paddock to get a final Valley glimpse of the man who has been a constant in their racing lives for three decades. Tipsy twentysomethings from all over the world gathered six deep on the rails of a packed Beer Garden to high five a man who left South Africa to seek fame and fortune in Hong Kong before many of them were born. Owners, trainers and officials all took their chance to wish him well as the evening progressed and Whyte’s fellow riders – headed by Zac Purton and Joao Moreira – formed a guard of honour to welcome him back to the weighing room. Cameras began to click as soon as Whyte weighed out for the first of his three rides on Iron Bravo in the Lambeth Handicap (1200m) but Chris So’s newcomer showed his inexperience in the paddock and could never land a major blow from midfield. Good Omen looked Whyte’s best chance of a winner in the Hong Kong Club Challenge Cup (1800m) but could only stay on for fourth, while the dream of a winning finish came to nothing when California Gungho finished unplaced from stall 12 in the Club Street Handicap (1000m). However, memories of a winless finale were soon forgotten as Whyte set out on one final ride up and down the home straight. Accompanied by an outrider, California Gungho walked slowly up the stand rail to the far end of the Beer Garden with Whyte taking time to shake dozens of outstretched hands while also tossing several pairs of pre-signed racing goggles into the throng. Whyte then nudged California Gungho into a gentle trot on his way back to the paddock, blowing kisses to the grandstand as he did so, and after weighing in for one last time at the Valley he outlined plans to gain training experience with Sir Michael Stoute, William Haggas, Aidan O’Brien, David Hayes and Chris Waller in the coming months. And so Whyte’s long association with the Valley – which has yielded 572 winners spread across over 4,000 rides since 1996 – comes to an end. However, this was merely the first stop in a farewell tour which will end at the track he made his own during a run of thirteen consecutive championships. Three more meetings provide 31 more chances to ride a winner, building to one grand sendoff at Sha Tin on 10 February. One of the great Hong Kong sporting careers is drawing to a close and, although the Valley failed to provide a fairytale finish, Whyte will be working hard to the very end. “It’s going to be more emotional on my last day when I know I’m not going to be back on a horse on raceday but tonight I’m holding it together,” he said. Whyte may have missed out on the winner’s enclosure on his final Valley night but the judgement that promises to take him a long way in his future training career played a key role in helping Victor Wong complete a sparkling four timer. 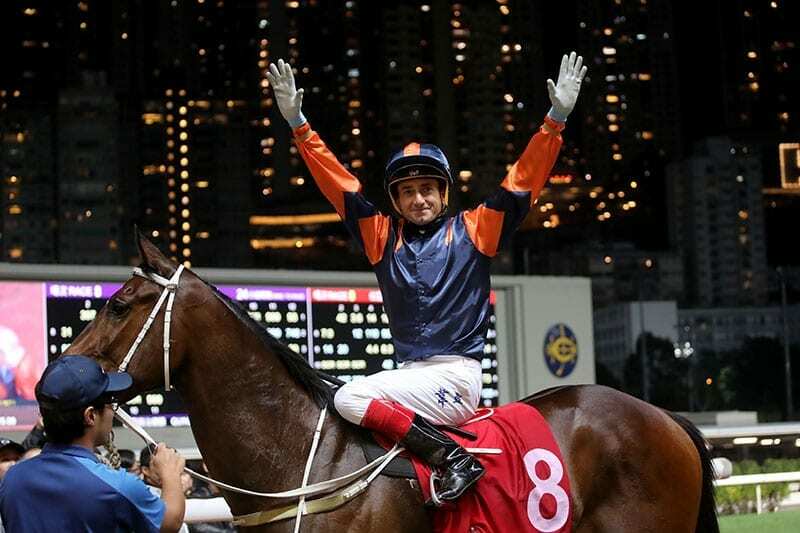 Hong Kong’s sole 7lb claimer had already landed the Murray Handicap (1200m) aboard The Show for Dennis Yip and the Edinburgh Handicap (1650m) on Danny Shum’s Charity Wings when he climbed aboard Encouraging in the Connaught Handicap (1650m). Wong was beaming with pride after completing the first treble of his career and things got even better for the 24-year-old when Moment Of Power forged clear in the Club Street Handicap (1000m). Paul O’Sullivan’s gelding made every yard for an emphatic success and Wong’s four timer – gained at odds of 7.8, 6.2, 4.8 and 11 – took him on to 23 winners for the season and into sixth place in the jockeys’ table and just ahead of a certain D Whyte! The race for the Hong Kong Airlines Million Challenge – which offers HK$1m in bonuses for horses who excel in Class 3 and above at the Valley – now has just one meeting to run. Several leading contenders came back across town aiming to improve their position but Country Star (66pts) and Red Warrior (64pts) extended their lead at the top of the table by winning the Hong Kong Club Challenge Cup (1800m) and the Chater Handicap (1200m) for John Size and Joao Moreira.